Aspen city officials said Wednesday they plan to seek water court approval to transfer the city’s two conditional water rights to store a combined 13,629 acre-feet of water in upper Castle and Maroon creeks to other potential storage locations in the Roaring Fork River valley. 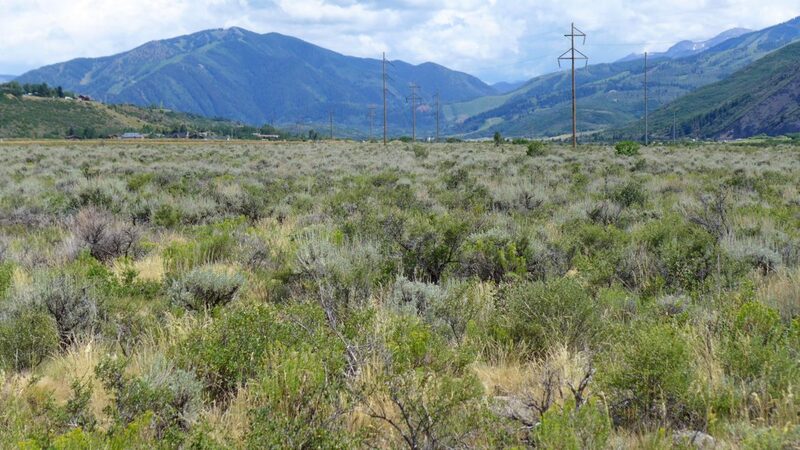 Those locations include 63 acres of land it has under contract to purchase for $2.65 million on Raceway Drive in Woody Creek, a neighboring gravel pit operated by Elam Construction Inc., the city’s golf course, portions of the Maroon Creek Club golf course owned by the city, and Cozy Point Ranch. Aspen City Manager Steve Barwick said at a news conference the city is not walking away from its conditional water rights tied to the potential dams and reservoirs on Castle and Maroon creeks, but instead is holding on to those rights while seeking to transfer them, and their 1971 decree date, to new locations. To do so, the city would have to file a new water rights application in water court and it would be up to a water court judge to determine how much of the current water rights could be transferred, and if the city can keep the 1971 decree date. In October, the city filed two due-diligence applications for its conditional rights on Castle and Maroon creeks and is now being opposed by 10 parties. The potential Castle Creek Reservoir would store 9,062 acre-feet of water behind a 170-foot-tall dam and the Maroon Creek Reservoir would store 4,567 acre-feet behind a 155-foot-tall dam within view of the Maroon Bells. The city expects to put forward a settlement offer to the opposing parties next week, with the potential Woody Creek storage sites at the heart of the offer, Barwick said. A settlement meeting is slated for Aug. 2. Paul Noto, a water attorney representing American Rivers, Colorado Trout Unlimited, and the Roaring Fork Land and Cattle Co. in the two water court cases, said Wednesday a “main issue” for his clients is whether the city will commit to “never damming” Castle and Maroon creeks. Both of the dams, which the city has told the state since 1965 it intends to build someday, if necessary, would inundate portions of the Maroon Bells-Snowmass Wilderness. “While the Castle and Maroon Creek reservoirs may have seemed like a good idea (in the 1960s), we congratulate the city for this win-win alternative that protects our iconic landscape and provides for the city’s water needs,” said Sloan Shoemaker, the executive director of Wilderness Workshop, in a press release. (Above is audio of a press conference held at Aspen city hall on Wednesday, July 19, 2017. The audio was recorded by Elizabeth Stewart-Severy of Aspen Public Radio. The main speaker is Aspen City Manager Steve Barwick. Also present at the press conference were Curtis Wackerle, editor of the Aspen Daily News, David Krauss, editor of The Aspen Times, Elizabeth Stewart-Severy, environment reporter at Aspen Public Radio, and city staff members David Hornbacher, Margaret Medellin and Mitzi Rapkin. Aspen city council member Bert Myrin was also in the room, but did not speak. Brent Gardner-Smith of Aspen Journalism can be heard asking questions via a phone on the table in the room.). The two Woody Creek parcels now under contract by the city include a 61-acre parcel and a 1.8-acre parcel. Both are owned by Woody Creek Development Co. of Fort Collins. The undeveloped 61-acre parcel is valued at $2.3 million by the county assessor and the 1.8-acre parcel, also undeveloped, is valued at $100,000. 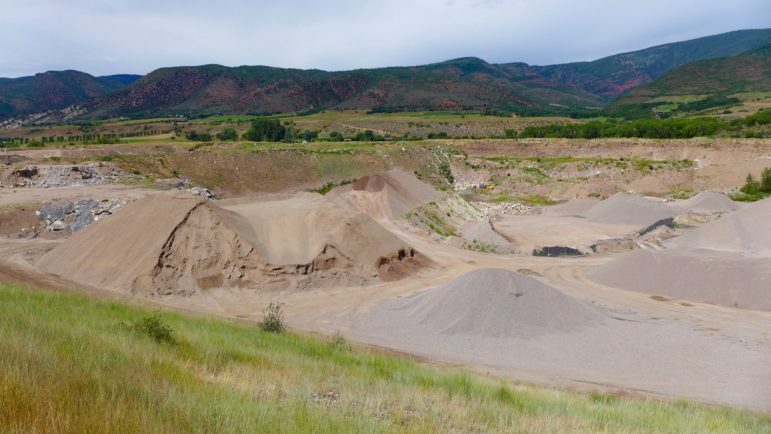 The city does not have an option to purchase the Elam gravel pit, which is visible from Highway 82, but is in discussions with the company about opportunities. The city also said it is researching “the environmental, hydrologic and geologic nature” of the two Woody Creek parcels, and Barwick said he expects the City Council to make a decision to purchase the land within 90 days. 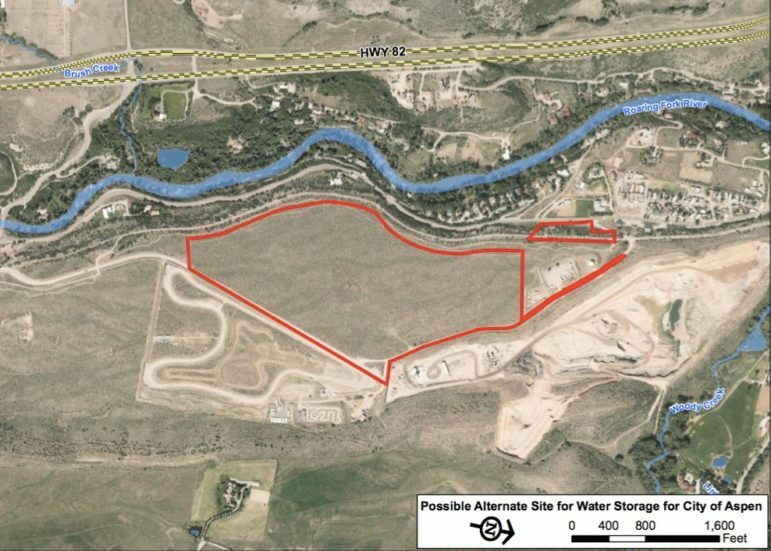 If reservoirs were developed in any of the potential locations, the stored water – if used to meet municipal water demands – would have to be pumped back up to the city’s water treatment plant, which sits on a hill behind Aspen Valley Hospital. He also said the Aspen City Council must figure out how much water the city may need to store in the future. A second work session on the topic has been set for Monday evening. A portion of the gravel pit in Woody Creek operated by Elam Construction. It's hard to capture the scale of the gravel pit, but the little yellow speck in the back edge of the pit is a large dump truck. Officials from Western Resource Advocates also praised the city’s announcement. But in a news release Western Resource Advocates also included a cautionary note. When asked about the city’s intention to try to transfer the 1971 decree date of the Castle and Maroon rights, Noto pointed out if they were successful, those rights would then be senior to the instream flow rights held on the Roaring Fork River by the Colorado Water Conservation Board and the recreational in-channel diversion rights held by Pitkin County in its new kayak park in Basalt. “They would be jumping ahead, essentially, of two large water rights, and I’m sure that will be cause for concern,” he said. Editor’s note: Aspen Journalism is collaborating with The Aspen Times on coverage of rivers and water. The Times published this story online on July 19 and published it in its printed edition on July 20, 2017. Aspen changing course on conditional water rights?